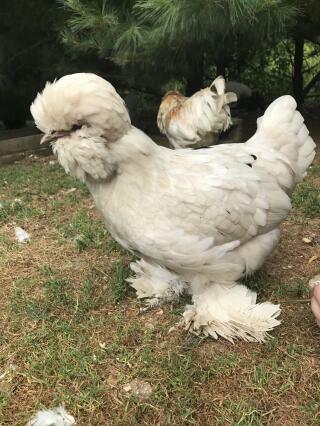 This breed is supposed to have lived in the Sultans castle gardens in what used to be called Constantinople and was originally known as Sultans Fowl. A Miss Elizabeth Watts of Hampstead introduced them to England from Turkey in 1854 and the breed almost became extinct in the period between the two World Wars. 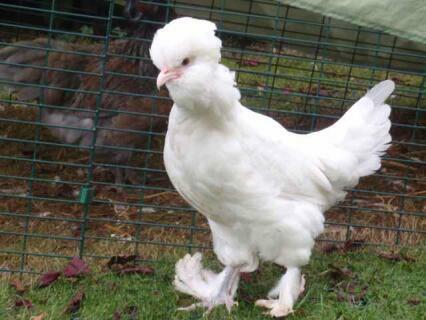 Thankfully it was resurrected by combining several different breeds but unfortunately this means that none of the birds of today have descended from the Sultans original birds. They are not good layers and tend to be kept for ornamental purposes because of their distinct appearance. 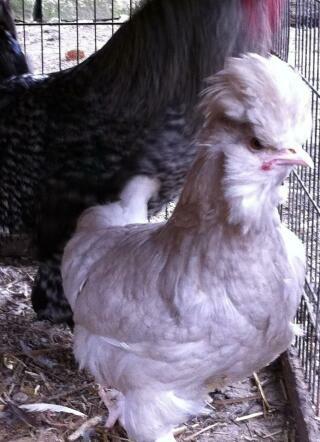 The Sultans are small, fully feathered chickens. The neck has a very heavy plumage which gives the head a shortened appearance. The head has a muff, three clumps of feathers which form a beard and a very large, globular crest. In front of that is a V-shaped or horn comb which is hidden by the crest. They have 5 toes and their hocks are very well developed and are described as vulture hocks while the legs are heavily feathered. Sultans are best kept in small runs as they are rather poor foragers. Their crest feathers have a tendency to freeze when the temperatures drop below zero and they find it very hard to cope with poor weather. They are calm birds which are not known for aggression and can be handled easily so make excellent pets. 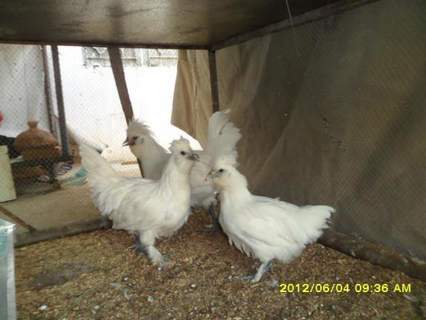 Hens are not known for being broody and do not make particularly good mothers while the chicks are slow developers. They are good fliers and can manage 2 metres easily so care needs to be taken with fences. The only recognised form for the Sultan is the white variety. The birds have grey legs and their reddish bay eyes and red earlobes are hidden by their crests. There have also been blue and black varieties of Sultan produced. I have a couple of Sultans and i love them. Sally is actually my best friend. I can pick her up and hold her for long periods and we talk. She also runs to me when she see me. The other Sultan is somewhat younger and i believe to be a male, and he is very trusting and is almost as wonderful. My question is.....can these chickens stand 20-30 degree temps at night? I had one die in the heat at about 100 degrees for a few days even though he had shade. I thought they were heat hardy, but i guess not. This is a great bird. 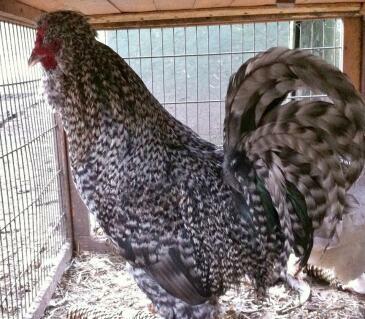 I have a rooster and two hens. The hens love attention and affection. 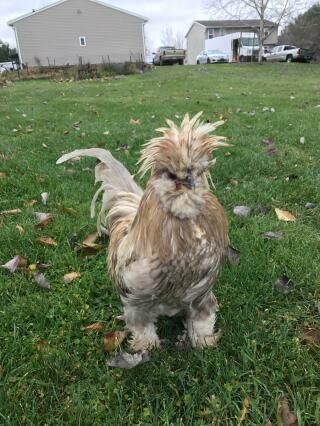 The rooster is a little devil at times but he's a rooster. I got these birds because they are so beautiful but mine are not as pristine and white as the picture. They love to roll in the dirt and mud. 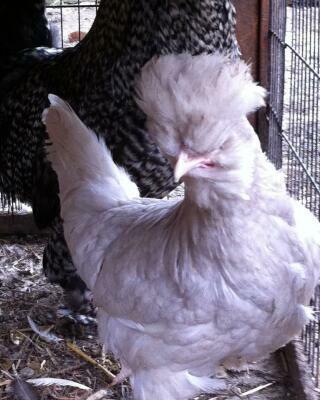 My pretty white chickens are now covered in dirt all the time. I still love this little breed and would have considered a different enclosure if I had known they would do this. I read others statements about poor foraging. Mine eat anything and forage very well. I have found that they love watermelon rind as a treat. They are poor egg layers, one per day, maybe. They will not sit on a nest, so no babies yet. 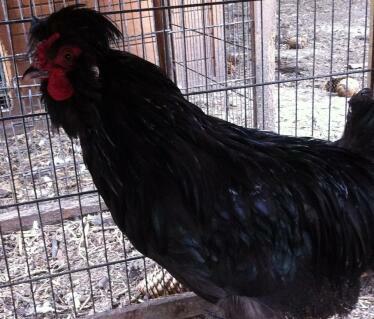 I would recommend this breed for pets but be leery of a rooster with the girls. We have a Sultan roo named Chipper. He is super friendly and intelligent. I read above that Sultans are not good foragers. I have to disagree! Chipper will often skip his breakfast feed preferring to scratch for worms. My husband actually showed him where to find the worms and when I'm out in the chicken yard raking or cleaning things up Chipper follows me around waiting for me to turn over a rock or log for him to scavenge under. When I don't notice him waiting or when he gets impatient for me to turn over that rock he pecks at me or nips at my hands. We adore the little guy! very friendly, look good. My girls went Brodie than gave up before hatching. Eggs in the incui and hatched a pair. Boys can be a bit load.